The deadline for new cheques under the Cheque Truncation System CTS-2010 has been extended till 31 March 2013 by the RBI. The move to replace cheques with instruments that meet the new cheque CTS-2010 Standard comes with benefits for banks and customers alike. The banks and the public are learning the differences between the old and the new instruments so that a seamless transition can be made. Here’s what you need to know. More people are using electronic means to send money and pay for goods and services. Increasing activity on online ticket booking and e-tailing websites is also driving a spurt in online transactions. Despite the growth in e-payments, cheques still remain to be the prominent mode of payment in India. Cheque Truncation System (CTS) is aimed at curbing the physical movement of cheques in the cheque clearing cycle to reduce delays and the risk of fraud. Electronic images of cheques will be transmitted along the clearing cycle as opposed to the financial instrument physically going from one institution to another. All new cheques complying with the CTS-2010 Standard are set to come with homogeneous security features and standardized physical features. 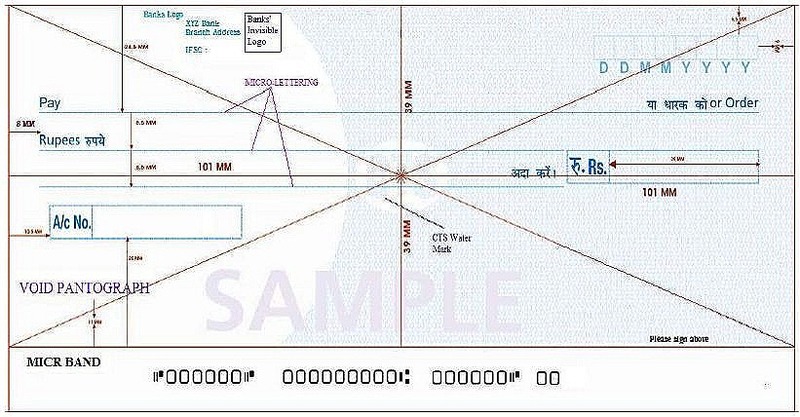 The new cheque format will make it mandatory for cheques to have the bank’s logo at the top left, VOID pantograph at the bottom left, new rupee symbol (?) before the amount field and a signature field indicated by ‘Please sign above’. How will CTS affect banks? The presenting bank, or the bank which collects the cheque, will capture an electronic image of the cheque which will subsequently be sent to clearing houses. The clearing house will receive the data and upon processing, forward the image to the drawee bank. Upon receipt, a return file will be generated by the drawee bank. The return file will find its way to the presenting bank via the clearing house after which the cheque clearing cycle will be considered complete. CTS will have a direct impact on the cheque clearing cycle’s efficiency as the need to physically move the cheque to different locations ceases to exist. Banks are likely to save on time, cost and resources as cheques will no longer be required to move from one place to another. Banks in remote locations will be able to move beyond the limitation of their far flung location. CTS is also expected to speed up the reconciliation processes of banks. RBI has also issued specifications under the CTS-2010 Standard for cheque forms which lays down the minimum and mandatory features that cheques must have. These specifications include various security features including standardized watermark, hidden VOID pantograph, UV ink-printed bank logo, holograms, mandatory field placements, clutter free background, etc. How will CTS affect the general public? The general public is likely to benefit from reduced time in the cheque clearing cycle as CTS adoption is complete. Settlements may become faster and as electronic images of cheques will be used, there is virtually no risk of losing a cheque in transit during the clearing cycle. CTS also paves the way for the physical cheque to change fewer hands in the entire cycle, reducing chances of fraud post presentation. The general public is also expected to benefit from standardized cheques and clear guidelines as there will be fewer grey areas. People issuing cheques have been advised to use dark coloured ink while filling out and signing checks. Once the new cheques become mandatory after 31 March 2013, corrections and alterations in cheques will not be entertained and a new cheque may have to be used in case of one. If you are issuing a cheque, be sure to avoid leaving gaps in the different fields, fill out payee/amount details clearly, sign only where indicated and use a dark ink pen. Cheques with mistakes or ambiguity face the risk of bouncing for non-financial reasons. Customers should get their old cheque books replaced with new ones conforming to CTS-2010 Standard for cheque forms. Encashing old cheques is also advised as they are expected to clear at less frequent intervals after the expiry of the deadline. Hope that CTS will reduce duplicates in the market. Big salute to RBI for introducing new technologies, thus making the transactions more secured.